A town in the government of Podolia, Russia, situated on the right bank of the southern Bug. It was founded in the fourteenth century. It was at different times subject to Poland, Lithuania, Russia, and the Tatars. In 1479, when the Tatars conquered and destroyed Bratzlav, more than 600 inhabitants, among them 400 Jews, were slain in one day. In 1551, when it was besieged by the Crimean khan Devlyet Girei, and the entire garrison and a large part of the population fled, the Jews heroically defended the town against the enemy. In 1569, at the time of a religious uprising of the Cossacks, the hetmans Nalivaiko and Kossinski repeatedly attacked the city, plundering and murdering without mercy; the Jews, of course, not being exempted. But the most terrible year for the Jews was 1648, when the alderman Martin Kalinovski delivered Bratzlav into the hands of Chmielnicki, who seized the town and massacred all the Jews. In 1664 the Russians slaughtered the Poles and Jews of Kamenetz-Podolsk, Miedzybodz, and Bratzlav. When the hetmans Voinaravski and Orlik plotted with the Tatars against Peter the Great, Bratzlav became the scene of horrible cruelties perpetrated upon the Jews. The town has been a place of shelter for the followers of Shabbethai Zebi and other sects, especially the Frankists and the Ḥasidim. 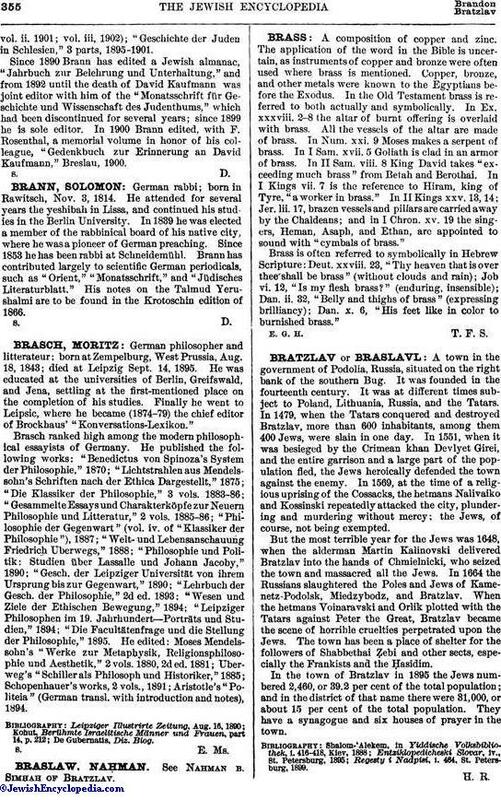 In the town of Bratzlav in 1895 the Jews numbered 2,460, or 39.2 per cent of the total population; and in the district of that name there were 31,000, or about 15 per cent of the total population. They have a synagogue and six houses of prayer in the town. Regesty i Nadpisi, i. 464, St. Petersburg, 1899.